No one knew how old the freight scale was in the old shed. The Acworth railroad depot had been decomissioned for some time and removed from Main street in the late 1960's. Just day's before that happened, a group of young Acworth's finest, led by one "Moose" McCray, rescued the freight scale and moved it to a safe location in downtown Acworth. The scales were already pretty old and missing a few pieces, but the main parts were still present and intact. When Mr. McCray donated the scale to the Save Acworth History Foundation the Red Onion Press workshop was approached by the Foundation and asked if we thought the scale could be restored and if we could do it. 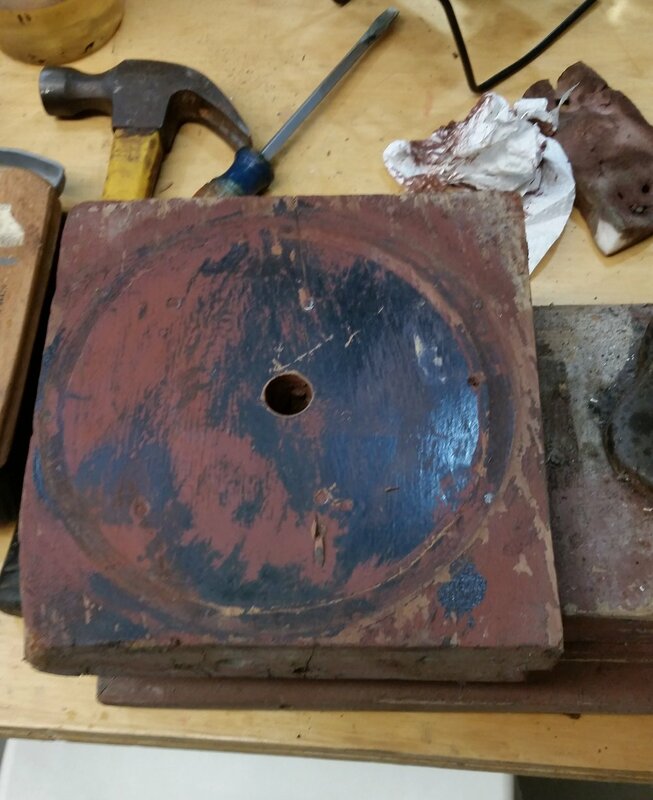 The Red Onion had just completed the restoration of a 1911 Chandler and Price Printing Press that had been found abandoned in a shed on Old Stilesboro Road, so the Foundation thought we might have the skills to restore the scale to it's original state and in working order. The Red Onion Press is made up of a group of professional artists, educators, craftsmen and volunteer members who share a love of arts, a knowledge of history and above all, working with our hands. We said absolutely, just our kind of project! Little did we know how much time and research it would take to find the information. Where did it come from? Who made it? When was it made? What did it look like? How did it work? The first big breakthrough was when we started to carefully remove the top layer of dirt and old paint from the wooden crown section. Underneath we could see a set of large gold letters that gave us the name of the manufacturer. HOWE was a company located in Vermont that was founded in the late 1800's and went out of business in the 1950's. There were several historical records on the internet that gave us clues, and we found that the company archives had been preserved at the University of Vermont. We also learned of several other Howe Scales around including one at the Bullock Museum in Texas and even a smaller portable Howe scale in the Glover Machine Works exhibit at the Southern Museum down the street. Our persistent researcher, Francine McEntyre was able to get a little information from the University of Vermont archives. We learned that a depot scale was referred to as a "dormant" platform scale. Dormant meant that the scale platform was at floor level, eliminating the need to hoist loads onto the scales. The top section was called the cap and the columns were called pillars. We knew that the scale was considered a balance type scale and worked by comparing the unknown load with a set of known weights. Unlike the original balance scales used since biblical days, 19th century scales used a set of specially designed levers and fulcrum points to enable the weight-master to compare the merchandise load to a set of much lighter official steel weights. A page copied from the an 1888 Howe Scale catalog told us that this size scale was rated for 2500 lbs! Unfortunately the staff librarians at the University of Vermont were unable to find any operating instructions or specifications regarding the color or the way the scale looked when it was new. There was no color photography in those days and no color drawings turned up in our research. We were able to find catalog model numbers, but there was no model number on the scale. We did get some parts lists from the archives to compare numbers cast on the frame, but these told us very little. We did find that the patent date of January 15, 1870 was stamped on the platform, which gave us a starting date, and the catalog showed that by 1888, the HOWE depot scale had been modified to incorporate a more precise measuring indicator that moved the connecting rod to the middle. That gave us the knowledge that the Scale was manufactured no later than 1888 and no older that 1870. The only color image we had of a restored HOWE scale was the one at the Bulloch museum in Austin Texas. That scale was heavily varnished and brown throughout. The curatorial staff at the Southern Museum let us know that the vivid black and green colors of their scale was not based on anything historical. However we found to our surprise that as got to the bottom layer of the paint on the cap of the scale that the original color of the paint under the pillar was a vivid royal blue. That we were able to match easily with modern enamel paint. The final task was to fabricate a connecting rod from the base of the scale to the balance beam. 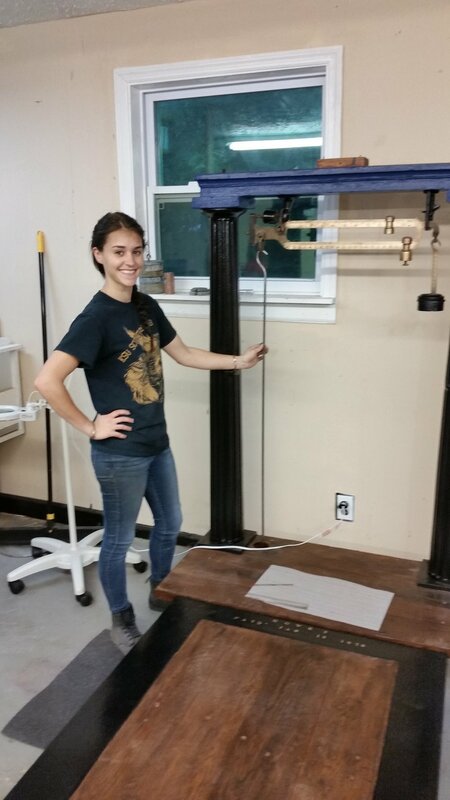 We measured the scale once it was reassembled and then commissioned a local sculptor, KSU student and now alumni, Megan Pace to heat form the double hooked steel rod to the correct length. Others who worked on the project include Hugh McKay and Pappi who transported the scale to the shop, Rick Paller and Richard Searle who helped with the filming of the project and other tasks, David McEntyre who assisted with some of the welding and Valerie Dibble who was able to accurately recreate the original lettering used in the HOWE nameplate. The crew at the Red Onion Press is proud of the work we did and look forward to new projects. Our printing program continues and we have a full schedule of educational workshops scheduled for the Fall. We are open during regular business hours when we are not away on deliveries (so call first), and the shop is always open to the public on Saturdays from 10 - 6 PM.